Are you planning a Greek wedding? 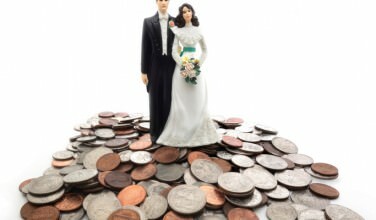 If so, you know that the first thing you need to do is contact your church to determine what you need to do in order to book the ceremony itself. For this, you will need to talk with your priest, book the date, and choose your Koumbaros or Koumbara. However, there’s more to an Orthodox Christian wedding than that! Chances are, you’ll want to have a reception, too. 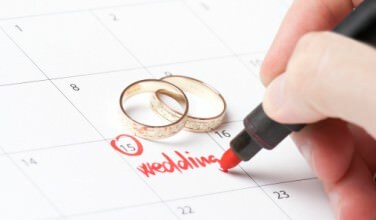 Here’s an overview of what you need to do to plan that portion of your wedding day. When planning a wedding reception, the guest list is where it all begins! Without it, you won’t be able to accurately choose a reception venue and make the rest of your plans. Granted, not everyone on your list will attend. However, knowing how many people you’ll be inviting should be your first step. Take the time to organize your list from the beginning. This will make all aspects of the planing phase much easier! 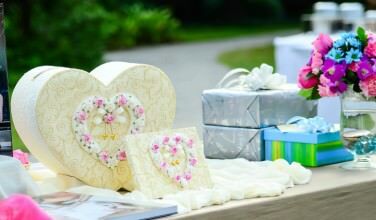 You will also want to select your wedding theme in the early stages of planning. This will help you select your wedding colors, favors, place settings, linens, and even your music selection! For example, if you have a Greek-themed wedding, you’ll want your wedding colors to be white and blue, the colors of the Greek flag. By choosing the theme from the beginning, you’ll be able to establish these small details from the beginning. Once you find your reception venue, the rest of the reception simply falls into place. However, finding the perfect place to host it can be a challenge. You can have your reception at your home, at a restaurant, or at a banquet hall. Many couples also consider having a destination wedding, which means that finding a reception venue can be an even greater challenge. It’s difficult for the rest of the details to fall into place unless the reception venue is booked. Many places also have package deals that include things like your wedding flowers, a limo service, and even a photographer. This is another reason why it’s a good idea to find the venue before you establish the rest of the details. Your reception hall will also help you select other details, such as the food you’ll be serving at your wedding. What kind of music will you have at your wedding? Do you want Greek music, popular music, or both? Many Greek weddings do include a mix of both Greek music and popular music. In addition to deciding on your music selection, you’ll also want to figure out if you want to hire a DJ or a wedding band. There are even bands that specialize in traditional Greek music! If you want to play a variety of music at your reception, it may be easier (and less expensive) to have a DJ as opposed to a live band. Once you have these major details established, you’ll be able to plan the rest of the details with ease!